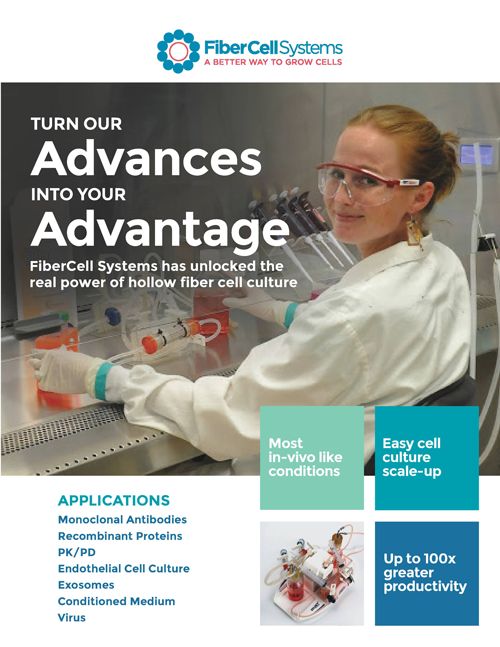 FiberCell hollow fibre bioreactors are ideal for researchers requiring significant in-house production of mAb, protein, exosomes or virus from an incubator-scale, low cost system. Other applications include antimicrobial PK/PD modelling, primary stem cell processing, production of conditioned media, co-culturing, cultivation of cells within fibres under flow and long-term perfused liver and gut models. 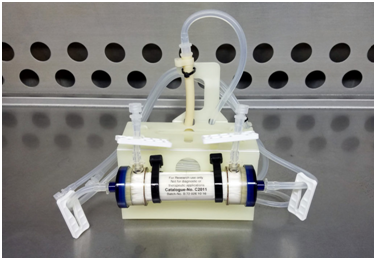 At the heart of every FiberCell hollow fiber bioreactor system is the Duet Pulsatile Pump. This is integrated into a compact platform that supports one or two independent FiberCell cartridge modules with associated media reservoirs. The system conveniently fits inside a standard CO2 incubator. Robust, durable, quietly efficient and affordable, the Duet Pump is a good investment for any lab getting serious about in-house scale-up of secreted products from mammalian cells [learn more]. Pre-sterilized, single-use hollow fibre cartridge modules 3ml, 20ml and 70ml, available in 5 Kd, 20 Kd MWCO. Special 0.1 µm endothelial cell cartridge also available. [learn more].